When you write a review, you’d want to write about a new restaurant opening up, or a new menu at an age-old house with an established reputation, or a famous chef concocting a new fusion dish. This time, I’d like to write about a neighbourhood restaurant that is going to close in a few weeks. So I will not review it in the usual way, with prices attached to each and every dish. 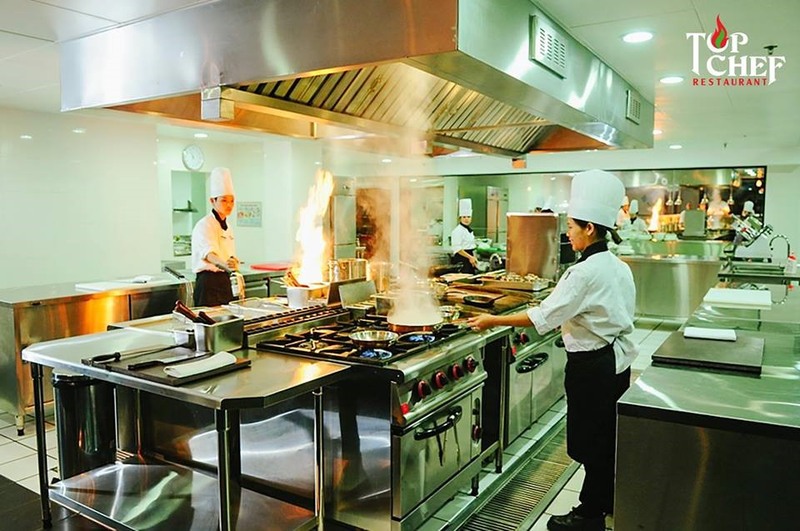 Top Chef restaurant is an upscale, trendy joint that serves western food to local clientele in addition to a modern well-equipped cooking school. 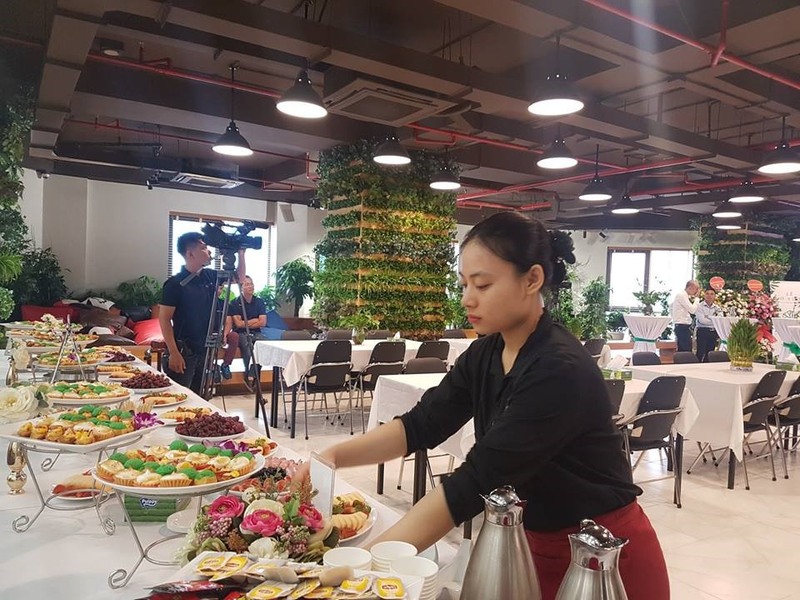 This model is not new to Hà Nội – Hoa Sữa Vocational School used to teach disadvantaged students and has their own restaurant. The same goes for KOTO, Know One Teach One and Reach, which serves Japanese food in town. In the past two or three years, Top Chef has added Vietnamese food to its menu and everybody loved it. We go there for weekend brunch, where each weekend they have different noodle soups available, fish noodle soup this week and beef phở, or chicken bún thang the next. It was convenient for families as it’s too early to cook in the morning. Coffee Vietnamese style or a cappuccino, or milk tea Taiwanese style, which school children love, so you kind of have everything for everyone in one place. Top Chef has an extensive menu of stir-fries, pasta and rice for quick lunches priced affordably in the mid-range compared to other eateries. We go there for special family celebrations and birthdays, to celebrate good grades at school or relax after a bad day. Top Chef kid’s menu is the best. Our neighbourhood children love its pizza and pasta and always want to have birthday parties there. Decorated creatively with just the table ware of bowls, soup cups and dishes, the restaurant can be a cool backdrop for young people to check in online. Plain lights are on at night all year round, which gives the window a heart-warming glow every time we pass. Fully equipped: Top Chef boasts a modern and well-equipped kitchen. Great spread: Besides dining in, the restaurant also offers a catering service. We celebrate our kids’ basketball victories there, as well as ballet and dance performances. Every summer our swimming championship has its party catered at the pool side. They donate to the children’s Mid-Autumn festival, Christmas events and it hosts a culinary booth every Tết (Lunar New Year). Top Chef is so much part of our lives we barely recognised it until it announced its closure. When we wanted a Vietnamese national dish that involved pig guts cooked in a particular way, they so kindly cooked it for us and charged a modest service fee, which made everyone happy. “Can we bring mắm tôm (shrimp paste) into your restaurant?” we asked because many upscale restaurants restrict the use of shrimp paste due to its pungent fragrance. “Yes, you can,” was an answer that surprised us all and we feel thankful until this day. Minh Khôi, a sixth grader, remembers when he had a cooking class for children at Top Chef a few years back. Now his mom says he makes his favourite dessert at home for the whole family.